Duties of PO, APO and OPO in Elections 2019. Polling Officers (PO/ APO/ OPO) duties divide at Election Timings : Polling Officers (PO/ APO/ OPO) duties divide at Election Timings ? పోలింగ్ సమయంలో ఎవరెవరు ఏ ఏ భాద్యతలు నిర్వహించాలి?. OP Duties, APO Duties and Other Polling Officers duties download in telugu. 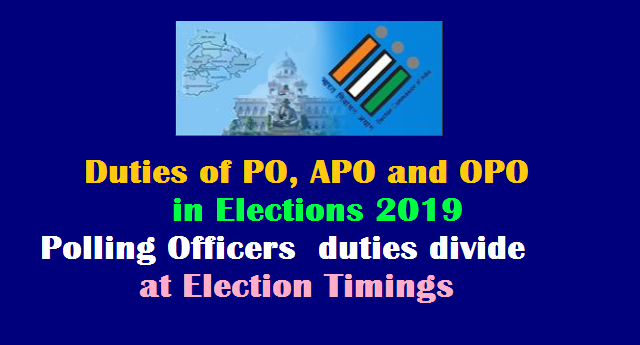 OPO / 1st polling officer duty in telugu 2nd polling officer duty 2019 first polling officer duty video, duties of polling officer in election April 2019, first time voters in 2019, other polling officer duties, duty of 4th polling officer for election duty list of polling officer 2019.